Scottsdale, Arizona, October 5, 2009 – Team matches kicked off this Saturday for the East Valley High School Junior Team Tennis League. Over 90 high school tennis players registered to compete in a 9 week league that plays at Dobson High School. The goal of this league program is to give all of the Varsity and Junior Varsity tennis players the opportunity to compete in year round organized team competition. Eight teams of 6-10 girls and boys gathered for the varsity session, while four more teams attended to play JV-level matches. Teams will compete in a round robin format, where each school will have the opportunity to play each other in one team match. A team match is comprised of one boys and girls singles, one boys and girls doubles, and one mixed doubles match. Individual games were counted toward the team score for each girls and boy’s singles, doubles and mixed doubles matches. The teams compete using a modified world team tennis format: no-advantage scoring and short sets up to 4 games. Play will continue every Saturday until the beginning of December. At the completion of round robin play, all the teams will be placed in a flighted championship bracket. The top two teams will compete for a chance to play at the Southwest Sectional Championship in Albuquerque, New Mexico. Alan Veeh, Taylor Cochrane and Geoffrey Russel helped put this tennis opportunity together. Being a former high school tennis coach and someone who has coached players to state titles, Veeh has all the skills to make this league fun and competitive for the players. His experience and knowledge of high school tennis and players was, and continues to be, invaluable. “As a former high school coach, I jumped all over the opportunity to help put a league like this together. Most of our high school players only get a chance to play organized team play during the high school season. This league gets the kids playing year round,” said Coach Alan Veeh. 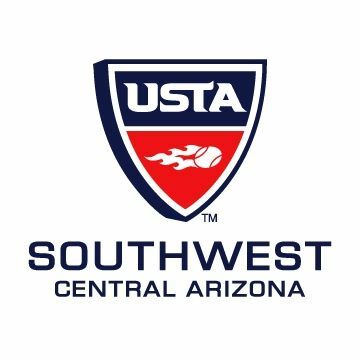 As a new USTA Central Arizona team member, Cochrane worked at putting together teams and organizing match play.